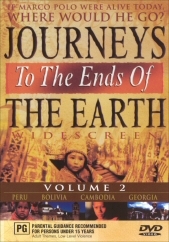 Journeys to the Ends of the Earth, presented by David Adams, takes us way off the beaten track in search of relics thought long lost in some of the most desolate places on the planet. His presentation skills are fantastic and in some circumstances really present the tragedies that mankind has wrought upon some of it's greatest works, the first and best instance of this happening when David goes to see the famous Bamiyan Buddhas in Afghanistan during the height of the Taliban Regime in that country. Afghanistan looked tragic as there are some many wonderful monuments there that have been destroyed by war over the centuries and the Taliban that it was heart wrenching. From a historical viewpoint, this doco is must watch material as the team are one of the last camera teams to actually film the Buddhas before they were destroyed by the Taliban. 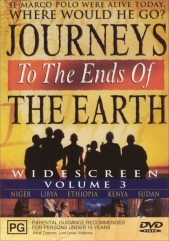 Other journeys take us to Africa and through Egypt. Having been to some of these countries myself it was interesting to see it all again. Adams presentations make the viewing interesting and actually encourage you to find out more for yourself upon completion of the DVD. We found ourselves looking up the topics covered afterward to further educate ourselves which is a testament to the quality of the show. The DVD only supports Dolby 2.0, however there is no real call to go the whole hog to 5.1. The picture is clear for most of the presentations however I did notice that during scenes with intense fog etc that the image pixelated somewhat. It didn't happen often however it was noticeable when it did. I found the extras (which are the same for every episode) to be informative and interesting. I think that this is the way for future documentaries to present themselves. Today, people want to go up and close, they want their presenters to be in the thick of it. The days of using a telescopic lens are over and I appreciated Adams getting up close and personal with all these people from all over the world. He isn't scared to go the extra mile to break bread with strangers, even cooking for them on occasion! I wholeheartedly recommend every disc in this series as it's interesting and will keep you riveted to your seat. 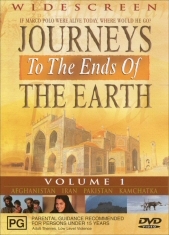 I also would consider getting this series for your school children to learn a bit more about the world they live in. AFGHANISTAN - In Search of the Lost Buddhas. Adams hitches a ride with the Taliban to cris-cross Afghanistan: a country where few westerners dare to go. He finally reaches the Bamiyan Buddhas, just before they are destroyed. IRAN - People of the Flame. Adams travels the Iranian wilderness in search of the Zoroastrians, an ancient people who have tended a holy flame for the last 1500 years. PAKISTAN - The Road to Shangri-La. Adams crosses the high mountains of Northern Pakistan in search of Shangri-La, immortalised by James Hilton in his classic Lost Horizons. KAMCHATKA - The Forbidden Zone. A journey through the arctic extremes of a primeval world; through the youngest landscape on the planet....across Far Eastern Siberia in search of some of the Cold War's darkest secrets - a journey to the beginning of the Earth. PERU - The Lost City of Gold. Adams climbs the lonely Peruvian highlands to seek an Inca artefact that has never been found: The Golden Disk of the Sun. He finds the uncharted remains of an Incan ruin. BOLIVIA - The Last Trail of Butch and Sundance. Adams follows the long lost trail of two of the most wanted men in history: Butch Cassidy and the Sundance Kid. His path leads him through the Bolivian Andes. CAMBODIA - The Lost World of the Khmer Rouge. Year Zero. The Killing Fields. Preserved by war in the isolated and forbidding final refuge of the Khmer Rouge are tantalising hints of the "Asian Unicorn", the khting vor. David Adams journeys through the dark side of Cambodia in search of this semi mythical beast. GEORGIA - In Search of Jason and the Argonauts. From the Black Sea to the Caspian, from former-soviet Georgia to Azerbajan, a quest for the Golden Fleece through the powder keg of modern day Caucasia. NIGER - The Land of Fear. Adams travels across the simmering heat of the Sahara with a Tuareg caravan, haggles for a pillar of salt and skis down the biggest sand dune in the world. This is the Land of Fear. LIBYA - The Ancient Chariots of Libya. A vast desert country veiled from the East by fear, prejudice and misunderstanding. Adams follows in the wheel tracks of Ancient Rome's "chariots of fire" - the first wheeled vehicles to explore the Sahara and discover a little-known land of exotic brilliance, ancient cities and forbidding deserts. ETHIOPIA - Keepers of the Lost Ark. Adams makes the pilgrimage from Lalibela to Gonder in the northern wilds of Ethiopia, and paddles by papyrus kayak across Lake Tana. His quest: to find the Ark of the Covenant. KENYA - Swahili Sinbads. Adams sails by dhow from Lamu to Zanzibar, stopping off on the beaches of East Africa to haggle and barter for his sea passage. Sinbad lives again. SUDAN - The Mystery of the African Pharaohs. Adams crosses the vast northern Sudanese desert and sails down the Nile all the way to Khartoum. Along the way he finds the pyramids of Meroe, silent sentinels to a long lost civilisation.